During his university days as a wide-eyed journalism student, Ross Sutherland caught word of an illicit underground club which stuffed its members into tumble dryers. However, his subsequent investigation inadvertently led him to become the ringleader of the shadowy ‘Wash Club’ he’d set out to expose. An incredulous true story that once heard was much too compelling to not transpose to screen, Director Simon Dymond tells Directors Notes how in collaboration with original unreliable reporter (and Script Writer) Sutherland, he took Wash Club from tall tale to short film. The first time I heard about Wash Club, I was listening to BBC Radio 4’s Short Cuts Podcast. It was a spoken word piece by Ross Sutherland on how he accidentally started a death cult at a 24 hour laundrette while at uni. It was funny, dark and entirely unexpected. It stuck in my head and I found myself pitching it to collaborators. The response was encouraging so I reached out to Ross. I had been wanting to find a project for iShorts 3 and after meeting up we both agreed to collaborate and submit Wash Club. I already had Producer Lauren Parker and DoP Karl Poyzer on board. By the time our project was shortlisted for the funding, we had clocked up four months of development. When Ross tells the story, there’s a rapid-fire nature to it. Time darts forwards from sentence to sentence. I wanted the film retain that energy and pace without resorting to voice-over. Our main character’s journey is almost completely insular. We didn’t want to leave the audience in the dark so Ross introduced a dictaphone as a way inside his head. There were a lot of locations – at one point over 20. We boiled this down to the bare minimum which allowed us to give the film a consistent look and tone. Ross and I would have long phone calls where we pitched ideas and broke story. There was a lot of discussion about the ending and we really didn’t know exactly how it would play until quite close to production. Do we tow the line of truth or take it one step further? Development was a balancing act between the objective and subjective aspects of Wash Club as well as practical and creative ones. It’s a film about investigating a sub-culture. Being on the outside and peering in. It’s voyeuristic. Creative England and BFI NET.WORK awarded us £5,000 and provided mentorship and development workshops as well as networking which connected us with other participants in the scheme. Normally you make a short, you go through it in relative isolation – but there were 16 groups all going through the same process. We could bounce ideas and contacts – it was a really collaborative environment. Jess Loveland at Creative England helped us every step of the way and connected us with our project mentors – Chris & Ben Blaine (Nina Forever). The Blaine Brothers were a rock throughout. They always pushed me to do better. In reality our budget could have easily been 20k had it not been for our dedicated crew, who all offered to work for free on the 5 day shoot. All our of HoDs put in their time and equipment in-kind and several crew members ponied up cash to get the film off the ground. We launched a crowdfunding page and raised our total budget to 10k. Ross was our secret weapon for the campaign video – he is charismatic and pulls you right in. We also shot some test footage which we cut into a teaser. Karl, Lauren and I scouted every laundrette we could find. We all knew how critical it was to find the right location. Everywhere was either too small or the design wasn’t right. We had one place pull out after they got nervous about the content. We were close to giving in when we saw this one spot with mustard yellow dryers, blue frame windows and red seats. It had a Pier Mondrian vibe. The owner was very generous and it was off from the main road which was a bonus for sound. Once secured, we were able to build the design of the film around it. It’s a film about investigating a sub-culture. Being on the outside and peering in. It’s voyeuristic. Windows and doors became very practical tools for exploring this thematically. Karl and I were keen to have as much control over the staging as possible so we built sets for two key locations. Our Production Designer Luke Hicks took on an insane job when he agreed to join the project. He had a spacious studio in the city centre we could use but it came with a clause – four storeys up and no lift. Everything from the ply-board and building materials to the camera and grip had to be carried up by hand. But it was the only way we could make the budget work. For ten days Luke worked with a small team to build two incredibly detailed locations. I helped where I could – breaking tools, painting walls and hanging doors. Starting with a blank canvas allowed us to communicate ideas and themes in ways I hadn’t been able to before as a director. The design had real purpose and it was incredibly satisfying to be able to jigsaw a camera trap when we needed a better angle. Finding someone to play Doug (Ross’ alias) was the biggest challenge we were expecting to face, but living in Nottingham we’re fortunate enough to have the BAFTA winning Television Workshop on our doorstep. The TV workshop has had their hand in casting the likes of This Is England, Utopia, The Witch – as well as producing talents such as Samantha Morton, Jack O’Connell and Toby Kebbel. We knew right away they would be our first port of call and Nic Harvey who runs the place was incredibly generous with his time and support. Tom Blyth was literally the first person we considered. I had seen him perform in a play put on by the workshop, but I didn’t want to end the search before it started, so spent some time considering alternatives before we all came to the agreement that Tom was perfect for the role. As it happened, Tom was about to leave the UK to study acting at Juliard in New York. Fortunately, our schedules matched and we were able to wrap the shoot 2 weeks before he left the country for good. We shot the film on RED EPIC with Lomo anamorphic primes. Karl and I had shot over 20 projects together by this point and had already developed a strong short hand. We both felt that the natural distortion of the lenses was a perfect fit for the films aesthetic. The nature of the story encouraged a cinematic perspective. The references to Fight Club were inevitable – although we strived to create something that felt original and not derivative. The Social Network was another strong influence – as well as Richard Ayoade’s The Double. I was enamoured by its distinct look and tone. I wanted it to be colourful, but dark and mysterious – it had to capture the bubble of a uni campus. To do that, we filmed mostly at night and restricted our exteriors to a very minimum – creating a quiet ambiguity to surroundings. Starting with a blank canvas allowed us to communicate ideas and themes in ways I hadn’t been able to before as a director. 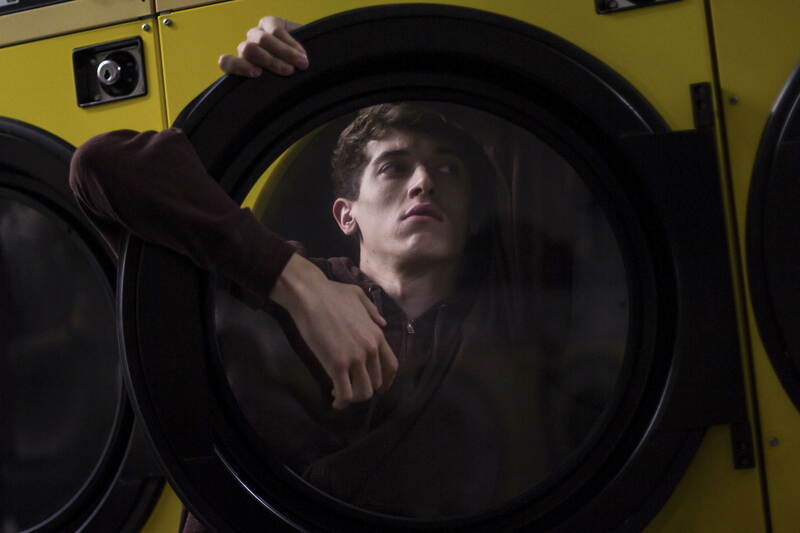 We filmed for five days straight with two consecutive night shoots in the laundrette at the end. The crew was the largest and most passionate I have worked with to date. Some were long time collaborators and others were fresh faces, but everyone was excited by the script and motivated to do their best. By this point we had been thinking about Wash Club for over a year, and the preparation paid off. I had shot lists but didn’t storyboard. There’s a handful of shots where I knew exactly what I wanted, but mostly we came up with it on the day as a team. Having been so close to the story for so long, the shoot felt really organic. The pieces began to fall into place and the film gradually took shape. A lot of people worked really hard to pull it off – I was humbled to have such dedicated collaborators. Our Editor Stef Hrycyk and I had to be brutal in the edit. We decided on a time limit of 15 minutes. Our first cut was 25! Finding a rhythm was incredibly important and a lot of it came down to pacing and balance. The narrative moves at a clip – so each scene’s length has an impact on the overall pace. One by one we cut entire scenes and a sub-plot that revealed itself to be superfluous. The style of the piece allowed us to be quite inventive when it came to advancing the story. Once we got to 15 minutes, we kept cutting. We were constantly asking ourselves if the story could be told more efficiently. I wanted to leave the audience wanting more. The film’s composer Jeremy Warmsley had joined the project early. Jeremy had previously worked with Ross and had scored episodes of the Short Cuts podcast as well as a number of features. He was such a natural fit for the project that it felt too good to be true. I put together a mix tape of music that was going around in my head at the time. The score for The Knick was one that kept coming up. He got to grips with the style of the film pretty much immediately and would deliver temp scores that Stef could cut to in the edit. We were constantly asking ourselves if the story could be told more efficiently. Sound is so important in film. When the opportunity to get Susan Pennington on board came up, we jumped at the chance. Adam Fletcher, our production Sound Mixer was especially keen. Susan is a Sound Editor based at Spool Post and worked on This Is England, Tyrannosaur and Hush. Susan was excited by the project and brought with her a wealth of experience and expertise. 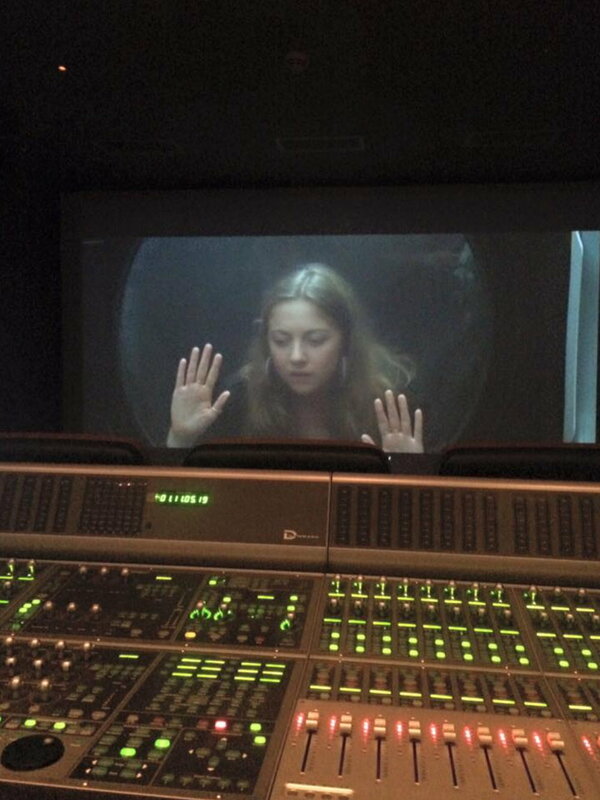 The film was mixed in Spool Post’s 5.1 mixing suite – and I got to be the client for once. From beginning to end, the project lasted 18 months. Prior to this, shooting music videos I’d got used to working in tight time frames. Having a long development period was welcomed with open arms. All that time to process the project allowed it to grow in ways it otherwise wouldn’t have. By the time it came to post-production, our schedule was tight but in a way, it helped us to make the tough calls in the edit. We shot a couple of pick ups one evening for a few hours – Tom was kind enough to jump back in, even though he was leaving the country a day later. Wash Club is currently submitting to festivals. As part of iShorts, the film has already been screened at four festivals in the UK, including LSFF and Aesthetica where it played to sold-out theatres. I am currently developing a small handful of projects of varying lengths. Another short and a feature screenplay. I find it’s good to have more than one thing in the pipeline at any one time. It keeps me from getting bored or overly precious with any one idea.